There appears to be two monuments for David O. Hulse in the Hulse family cemetery. One, identified as #2 in the cemetery inventory, is likely the orginal gravestone. While still mostly readable, it has become well weathered. A second more impressive monument, identified as #6, memorializes both David and his wife Sarah Hallock. She died thirty-five years after he did; and this second monument was likely erected after she died to memorialize both "Father & Mother." He was known as "King" David Hulse, because of his stentorian pronouncement that the "King" was coming (i.e., the Christ). 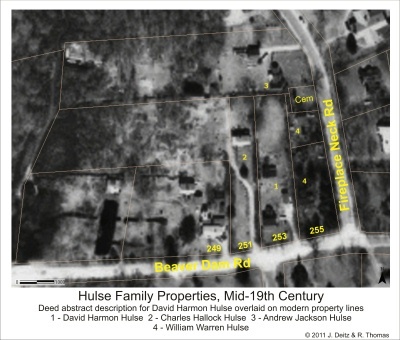 To this day, the Hulse cemetery in Brookhaven Hamlet where David Hulse is buried is sometimes called the "King David" cemetery. .. evidence suggests that Nehemiah Hulse built the origin of this house in the waning days of the 18th century. This document is Site Data Sheet Br28 on this site. If this is correct, then parcel 2 would have been that of his brother, Charles Hallock Hulse; parcel 3 that of Andrew Jackson Hulse, and parcel 4 that of William Warren Hulse. The youngest brother, Van Buren Hulse, is not mentioned in the abstract; he may have been granted another parcel not touching David Harmon Hulses parcel. Since this diagram associates a mid-19th century description with modern property lines, it may not accurately reflect the property lines at the time of the abstract. .. this is one of two monuments with a memorial to David O. Hulse (see no. 6). He is the namesake for the cemetery. .. this is the second memorial stone with a memorial inscription erected for David O. Hulse, perhaps by his children following their mother's death. [S463] Brooklyn Eagle, 7 Jul 1895, pg. 8. [S483] Seversmith: Colonial Families of Long Island, p. 1520 [http://content.ancestry.com/Browse/BookView.aspx?dbid=14260&pageno=1520 ]. [S94] Cemetery: David Hulse, Stone 6..
[S135] Portrait and Biographical Record: Suffolk Co., p. 550. [S3] 1850 Census, p. 118. He does not appear in the 1850 census in the household with Sarah Hallock Hulse..
Seversmith indicated that "They were married at the Caroline Church, Setauket, NY by the Rev. Zachariah Green." This is extremely unlikely. The Rev. Zachariah Greene was a famous Presbyterian minister at the Setauket Presbyterian Church. [S919] Zachariah Greene Eulogy, http://books.google.com/books?id=_rQEAAAAYAAJ&printsec=frontcover#v=onepage&q&f=false.